When excluding yourself from the equation and placing others on the stage, claiming I know what you need/need to do, that we fail to do ourselves and talk a good lip service and for most part deserve what’s coming to us, because we didn’t take responsibility first before telling others I know what you need, in our minds when we see somethings amiss, then say what a mess and point out what it is, without saying a damn thing to them. The picture seems so clear in our minds because (for most part) we actually know what to do, but think knowing is the battle and not half, where again (it was said) knowledge and information without application is useless, so why use it before testing it out on yourself first, worst that could happen is you start changing and if change is not prevalent, then what you know is part of the sideshow that’s not worth showing, like a sidearm that really harm others in their processes, especially when no one has asked you s***, but we won’t quit, because it makes us feel better the more we think good karma is at play, then walk away straight into a problem of our own, and wonder how the hell am I going to get myself out of this alone, when what we should have done is follow our own words, to become the learning curve we so often seek to be, but stay in our minds about it without moving an inch towards change. Interesting how when learning something new, we don’t think to apply, but how it could help you, and can’t wait to share it as a conversation piece, instead of sharing it as a realization I see, that has helped me to get to know myself exponentially, at a rapid pace, but paced myself when walking through points, to get to where I am now walking out of points, on my own, which is important when looking to share what we think others need, when what they need is not to be pacified with what we perceive, but please it’s not to deny helping when help is being asked for, as we all have been in that position before, and still now for some things that some of us need help seeing, but once shown I still have to do it all alone with just me. So, this point came up the other day when standing at the bus stop, where someone walked pass talking to themselves out loud, but when they passed still happily said hello and/or good morning, and as I relied they continued walking by, but not only that, I notice how the first thing that came up within me was what I thought they needed, in knowing what it is they were facing within themselves, but started going too far down the rabbit hole about them, then caught myself with the question, ‘why is it that I/we are so interested to tell others what they need (first thing), instead acting on our need to change ourselves first, I then applied self-forgiveness in the moment, but the point still remains, where in having a closer look at it, realized how (for me) this was something that I’ve done as far back as I can remember, being defined by a belief in what I knew as knowledge and information, and also the point of wanting to be seen as a saving grace of sorts, but never graced myself with the consideration for others and their location in their own process, which oddly enough is how preacher are bread, mastering the art of projecting knowledge and information onto others and making them believe it, through fear or a form of praise as ignorance, which shifts the path of others onto our own, and so alter their process. 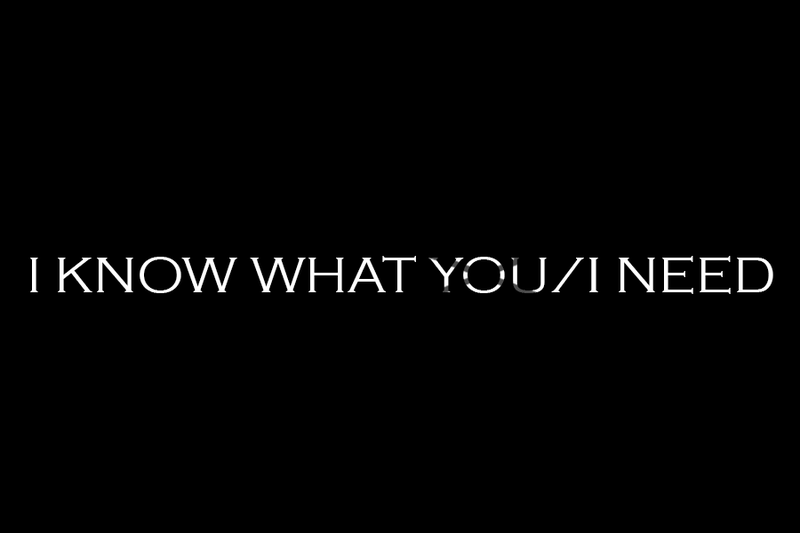 Therefore, “I know what you need” is but a look in the mirror, when seeing what can be show through the eyes of another about ourselves, in the form of any reactions we have when seeing their experience and wanting to make it our own in a way. Thing is to place ourselves in their shoes, unconditionally and watch a world of gifts open up to you, to see that we in fact need to help ourselves, that’s sometimes done through seeing somebody else.